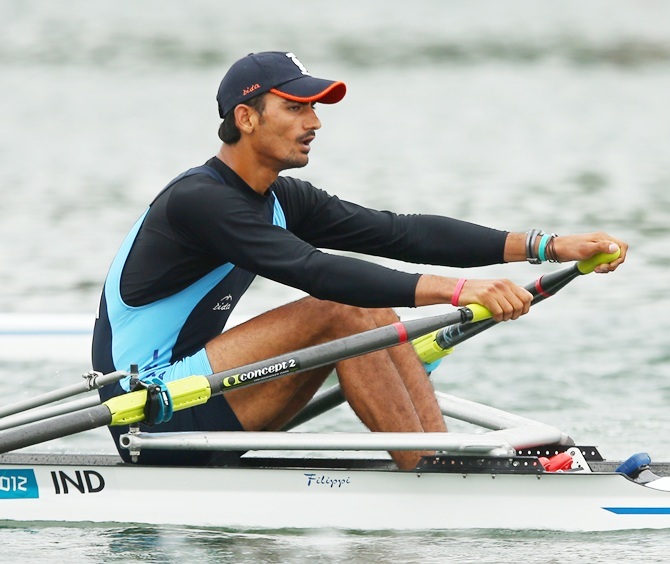 India picked up two bronze medals from the Asian Games rowing arena in Incheon on Thursday as army man Swaran Singh Virk rowed his way through exhaustion to the third spot in single sculls before the men's squad added the eights title. The performance was lower in both quality as well as quantity to the 2010 tally of 1 gold medal, 3 silver and 1 bronze. Sikh Regiment's Naib Subedar Swaran Singh must be complimented for putting up a brave effort. The timing he clocked to win the bronze covering the 2000m distance (7 minutes, 10.65 seconds), was better than his performance at the London Olympic Games two years ago timing wise (7:29.66). But the extra effort the 24-year-old former volleyball player put in towards the end when he tried to ward off the challenge from South Korean rival Kim Dongyong, who secured the silver, saw him collapse due to exhaustion. He fell off the boat into the water, and had to be taken out by the rescue team to the ambulance. "He should be fine. It was just exhaustion which happens to rowers at times. It was a brave effort as he was struck with severe back pain over the last three to six months and we had to work really hard to get him back into shape," said Rowing Federation of India secretary general M V Sriram. Swaran Singh, who is 1.89 metres tall and weighs 88 kg, led the field of six rowers for the first 1 km of the race and was comfortably headed towards the silver, after being overtaken by Iranian gold medallist Mohsen Shadinaghadeh, who clocked 7:05:66. But it was Korean rower Dongyong, who eventually took the second place in 7:06.17. Bajrang Lal, the lone Indian gold medal winner in Asiad history, later said that he was pleased to win a bronze after the team was in 4th position.